So what if I like chicken nuggets? Coo coo coop. Project Springtime part 3. Project Springtime Part 1: Making a home for baby chicks. Vitamin K is a group of fat soluble vitamins: K1, K2, and K3. K3 is synthetic and I personally advise against the use of synthetic vitamins whenever possible. K1 and K2: K1 (phylloquinone) is made by plants, so it is only available through plant sources like grass, nettles, kale, etc and is converted to K2 through a cow’s (and various other animals) stomachs, and then more bioavailable and absorbable form for us humans. We have a limit on the amount of K1 we can use and absorb, since we are not equipped with the same digestive systems as those animals so while it IS useful for our mineral content and a good form to use for clotting factor, at a certain point that levels off, and it may help support the body and the teeth/bones, but the different forms of K have different biochemical pathways, so you cannot expect them to have the same functions. Neither should not be ignored or minimized, they are both essential. K2 (menaquinone) has 2 forms, MK4 and MK7. MK4 is produced by animals from K1, so you can find it in the highest levels in dairy products of grass fed cows (particularly the “summer milk”) and also things like goose liver in the highest concentrations. Other animal livers and good quality egg yolks also have K2. MK7 is synthesized by bacteria, found primarily in natto (fermented soybeans) which is available, though perhaps not everywhere, and the ingredients should be monitored since often preservatives and other unwanted ingredients can be found in packaged natto. It is somewhat unclear at this point whether MK7 is a satisfactory substitute for MK4. These are essential nutrients, however, they do not complete their work as effectively in the absence of the appropriate ratio of naturally occurring Vitamins A and D, which is somewhere between 4 and 8 but hard to pinpoint exactly. It’s also hard to know exactly what amounts of A and D are in each batch of cod liver oil, for a variety of reasons, but we do know that the naturally occurring vitamins therein are in the proper ratio and do not cause toxicity. In a nutshell, because this is lengthy: take 1-2tsp fermented cod liver oil daily, with an equal amount of grass fed ghee. If you cant take it straight, encapsulate it yourself – carefully. Weston Price, dentist turned ethnographer, went around the world in the early 1900s searching for answers about dentition. Some groups of people had perfect dentition even without brushing their teeth, and some had terribly jagged teeth with malformed facial structures and rotting teeth to boot. The primary difference was diet: those maintaining their culture’s traditional diet were more likely to have perfect dentition, and those who had adopted the westernized diet (the inclusion of refined flour and refined sugar being important differences from the traditional diet) had the rotten and malformed dentition. He even found a few groups experiencing westernization while he was present, and a few families where one sibling maintained the traditional diet and another adopted the western diet. These family comparisons illustrated the point further: refined sugar and flour are implicated in the deviation from perfect dentition. Studies were conducted comparing the saliva of traditional dieters and modern dieters, and the effects of the two salivas on the calcium and phosphorus in ground up teeth. More calcium and phosphorus were brought IN to the teeth of the traditional dieter’s saliva, while the modern saliva leached calcium and phosphorus OUT of the teeth. Benefits of fermented cod liver oil ad grass fed ghee are not limited to dental health, though the dental benefits can be astounding: soft dark cavities have been hardened and color normalized with high (2 – 3 tsp) daily doses of fermented cod liver oil and grass fed ghee. Children’s dental demineralization can be halted if caught soon enough. Because the vitamins are in their natural state and proper ratio, they are not toxic. It is imperative to get cod liver oil that has NOT been refined or deodorizer, as these have al had the vitamins stripped and synthetic vitamins have been added. Synthetic vitamins carry a risk of toxicity in high doses. Green Pasture makes the fermented cod liver oil, and Rosita Real Foods makes an extra virgin cod liver oil which should also be sufficient. Grassfed ghee is more available now than ever, but beware of poor quality ghee. I believe the bees are in trouble, because of our collective ways of using and abusing this planet. Naively, I also believe we can help them. I bought a Flow Hive during their massive crowdfunding campaign. It’s been sitting unopened in 2 separate brown boxes for over a year. The last place I lived had a “no bees” policy. In preparation for getting a nucleus of bees, I have been doing internet research. To be honest, I feel a little scared. When I was a very little girl, while bees and wasps were still the same thing, I was at the house of my parents’ friends. They had a very mean little boy, about the same age as my older brother. He was old enough to know better. They also had a big slide, the kind with the big red metal arch over the top that I had seen on playgrounds. I remember asking the boy for permission to go on the slide. I remember the grass hadn’t been cut, it was long and dry from the heat. I remember getting to the top of the ladder and seeing that it was full of bees and wasps (I now know it must have been just wasps) and not knowing if I should go quickly through and slide down fast or back down the ladder slowly, because they were angry and after me. I think I screamed. I think I chose the fast route. I don’t remember what happened next, the only other memory I have from that incident is sitting on the bathroom counter with my mom and the boy’s mom, crying, as my mother consoled me and cleaned dirty feet and my many stings with a washcloth. From then on I was told I was allergic to stinging insects, as I would swell up excessively if stung. Many years later I was on the other side of the continent, and I had another encounter – with real bees this time. I wasn’t having a very good day, for a multitude of reasons I won’t go into here, and I was walking to golden gate park while crying and feeling sad and angry. I was noticing that every square foot of the city felt like it had been trampled on, even in the beautiful, huge, lush park I could smell the stench of old urine and see dirty evidence of humans everywhere. I desperately wanted to find a little patch of undisturbed nature. A bee caught my attention, flying directly across my line of sight, and very close to my face. I stopped. I heard buzzing, saw more bees, and walked slowly closer to them. A hive in a tree in the park in the huge overpopulated dirty city I had just been mentally complaining about had me transfixed, and grounded, and awed. I stood and watched the bees for quite some time. They have very specific flight paths, I noted. Their cooperation is beautiful and steady, predictable. I searched carefully with my eyes for the hive deep in the tree trunk, in vain. My breath was slow and I had regained my sense of self, my sense of purpose. That sounds dramatic, but it’s true, that experience changed something in me. I didn’t want to go back home for a long time, and by the time I felt the urge to start walking I was full of such joy and excitement I was practically skipping. Now I’m in a different chapter of my life, a very different chapter, and about to bring a colony into my tiny backyard. Ten thousand bees. Here we go. It takes about a thousand curse words to complete a chicken coop like mine. Also, it isn’t “finished” but it’s complete enough that the chicks have been living in it for a week. 6 week old chicks can make a huge mess, by the way. I’m still cleaning up chicken droppings from my porch, but that’s another story. 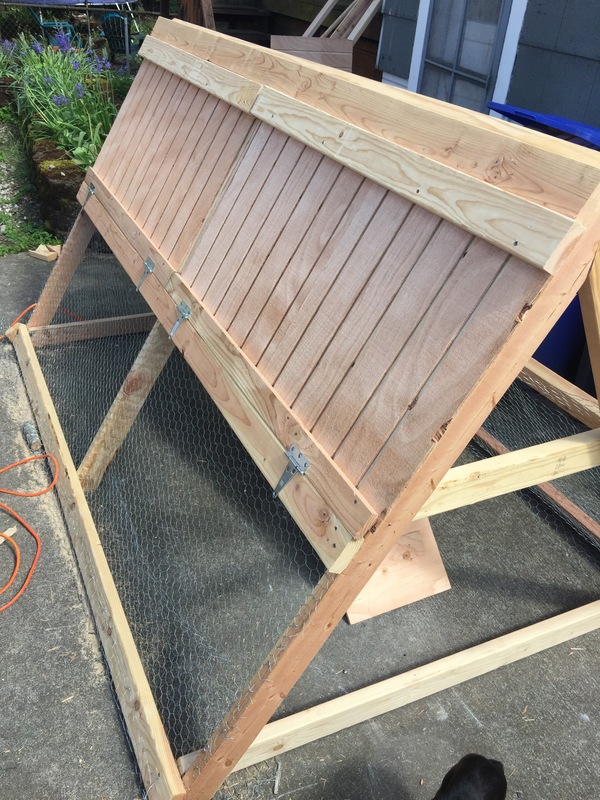 The coop: I liked the plan because it appeared to be simple and straightforward, with an enclosed run below and a coop above for sleeping and laying eggs. I learned a whole lot. I’m not a total stranger to woodworking, but it has been many years since the last time I smelled sawdust. It’s particularly important to measure. Everyone will tell you that when you’re working on a wood project, especially when you’re a woman and they’re a man. But it is important. I measured everything except the space I was putting the coop into. I just eyeballed that. Whoops. I’m raising urban chickens, so space is at a premium. That was another factor for the coop selection. In my mind, 5.5 by 8 feet is easy to estimate and not so big. Not only is it big, its heavy. So the space was an issue, but only by a very very small margin, I’m talking a couple of inches (turns out I’m pretty good at eyeballing measurements!) in the wrong direction. The “landscaping” in the “backyard” here is odd: a mature chestnut tree is immediately surrounded by painfully rough and jagged but uniformly white rocks, and then a narrow long raised flower bed with bricks bordering it goes around 3/4 of the perimeter and opens up to a little garden bed. The rest of the functional “yard” is a concrete slab. I planned to put the coop in the unusable portion of the “yard” behind the long narrow raised flower bed, between it and a (commercial) building which butts right up against this property line. That space, without the bricks on the far side, is about 5.5 feet wide but it has variations that didn’t allow the coop to sit on the ground. Luckily, there was an abundance of concrete blocks lying around (and also on the backside of the flower bed, where nobody was looking so it didn’t need to be the pretty/expensive scallop shaped brick). I decided to make a perimeter (hah! That makes it sound homogenous) of concrete blocks, and rest (hah! That makes it sound easy) the coop on top of that. Problem 1 with this plan was that the coop was already over in the spot, teetering on little protrusions, somehow balanced but NOT FALLING APART BECAUSE ITS A STURDY…THING. I’m still amazed by this, as you can tell from my use of the caps lock button. My help (limited to 2 minutes in between watching the kids and leaving for work) from my partner was getting it over there from the slab where I built it. I could not have done that part alone. The rest (save for that one side he was available to help on) I completed alone. It can be done. So there it was teetering, and I’m thinking I have the answer in the form of concrete blocks so I start tossing them into the coop, then I enter the coop and lift the coop by the crossbars with my back while simultaneously shoving the concrete block “perimeter” in place under it. This was by far the hardest part of the project, and while the pain of it did not compare whatsoever to giving birth, I’d like to avoid repeating it. Some areas have extra blocks in front of them – a halfhearted attempt to disincentivize predators. I had to finish the front and back (2 triangles) after the placement. 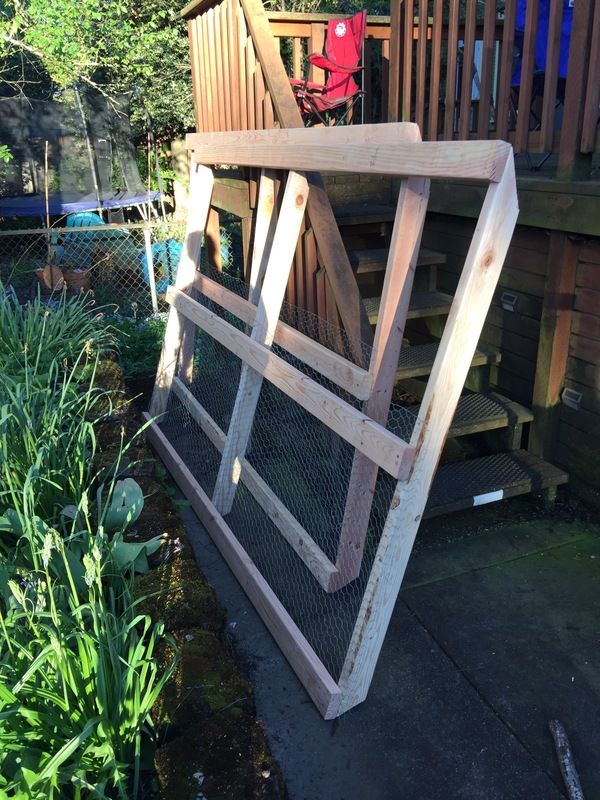 I was unable to procure hardware cloth and unwilling to use more chicken wire (many urban farmers were telling me horror stories), so I chose instead to go “off-plan” and build doors. I stand by this modification, though it is still one of the least complete parts. I was freehanding the circular saw to cut the plywood, which resulted in uneven sides of the doors – wavy, even. I kept having to take them back to the makeshift table (a slab of thinner plywood on 2 plastic sawhorses) and shave off a bit more. Once I was able to fit them in while the coop was on the slab, I expected to be done with that part. 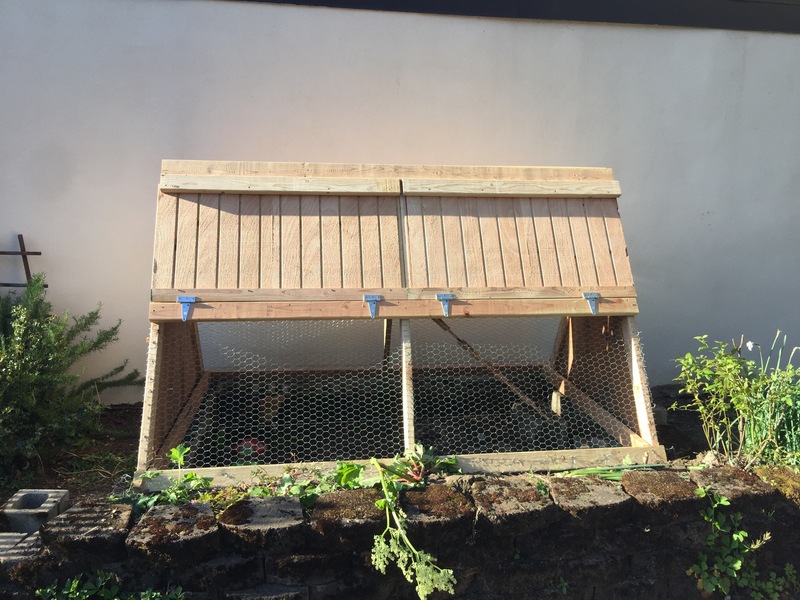 However, the weight distribution along the concrete block perimeter, coupled with the blocks themselves sitting at slightly different heights (undetectable to the human eye) meant that the doors did not fit perfectly once the coop was in its place. Lots of shoving, and bits of lifting later, and one door had 2 hinges. The other is just jammed into place, but it’s on the side I don’t need to open. Funny thing, today the heat lamp bulb exploded, so I had to open that door I thought I wouldn’t have to open. I used a hammer. Don’t worry, it’s still in one piece. Oh there was one other thing I didn’t measure correctly: the placement of the center stabilizing bar on each side. I didn’t see the measurement so I assumed t was halfway up. Later, when the cross bars went in (the ones cut at 30 degrees, which hold up the coop floor), they didn’t sit flush with the stabilizing bar – it was a couple of inches too low. That, of course, meant the side doors (the primary access points) were not the right size anymore, so I had to add a custom trim of a 2×4 on top. It came together in spite of these challenges and I’m proud of my work. Front and back doors: trim, add hinges. All open spaces: add hardware cloth. Waterproofing: silicone sealant for top gap, ?for other areas around doors. The chicks love their coop, although only one can get up and down the ramp. They also love papaya seeds and finding worms. They’re cute chickens. It has been cool and rainy every day. All the plants are behind schedule. I’ve had materials for the chicken coop for a month. Boards are cut to size, ready and waiting for me. Today it was 85 degrees. I do almost everything with my baby strapped to me, but using a power saw is where I draw the line. Actually she draws the line a bit before the power saw, somewhere around hammering or leaning over to measure, but we most certainly will not use the power saw together. I finally had the combo I needed today: another adult and no rain. I chose an A frame coop by Ana White, as it seemed simple and moveable. We are renting and hoping to buy in the next couple of years so I want to take it with us. The top of the A frame has board ends cut at 60 degrees off square. I had our super awesome neighbor’s help the other day getting the 30 degree cuts completed but he didn’t feel comfortable doing the 60 degree cuts. Here is the first thing I learned doing this project: 60 degrees off square is tricky! I am lucky to live in a town with a tool library, so I signed up and borrowed a chop saw. 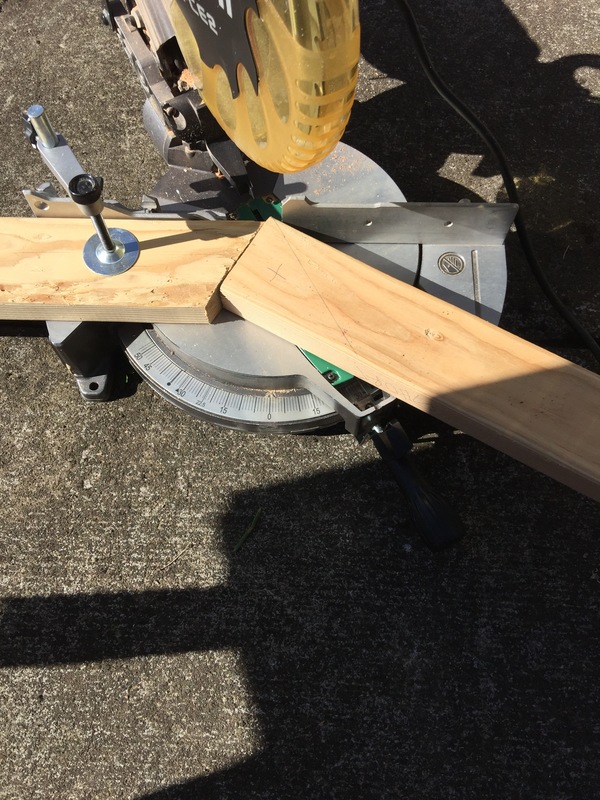 I used one of the 30 degree cut boards as a jig (a device that holds a piece of work and guides the tools operating on it) and secured it to the saw. Then I put the board against the 30 degree cut board, with the blade still set at 30 degrees, endured it was even with my line, and cut. It wasn’t perfect. I was still proud. I had to tear off the pieces that were not completely cut off but very close. Then I set the blade to the highest number possible, somewhere around 53, placed JUST the part that hadn’t been cut off into the blade line, and chopped that off. Then I began to assemble the sides of the coop, but baby was beside herself and I needed reinforcements. My other half came to the rescue and helped complete the first side, and by then baby was calm, so I quickly put together side 2. Putting together the sides was slowest during the chicken wire securing part because we couldn’t find the staple gun – I put the chicken wire on from the beginning, with staple-nails and I wish I had just sprung for the hardware cloth (nevermind that my supply total was just over $200 as it was) but I think I’ll get some and put it over the chicken wire and the flooring anyway. The sides look good. It appears the next steps should be relatively easy. I’m planning to put doors on the front and maybe then back too for easy access everywhere. They’ve got to get off my porch. Do you know how messy chicks are?! It all started a few months ago at the grocery store. We have an excellent local chain grocery here and they often have sampling of new or interesting items. I had been craving fried chicken, and had just recently burned my arm with the oil while making what I considered (unfortunately) sub-par fried chicken. I still have a couple of marks from those burns. Anyway, we were at the store and the sample was breaded chicken tenders, an organic version and a gluten free version. Both tasted good for frozen food, and they had an excellent coupon so I bought a package for those super-hungry-kid moments. I think I ate most of them. Fast forward a couple months and I’ve bought them 2 more times (without the extra good coupon) and eaten them all myself on nights when, like tonight, the baby needed to get to sleep an hour ago but I haven’t eaten dinner yet. Each time I’ve thought, I should just make these – they’d taste better and be less expensive. I think the package was about half a pound for $11 – on sale. So today I made them. They were MUCH better, and much less expensive. As usual (especially with the first time I make something) I didn’t measure anything but this will be a repeat recipe. This is a good one handed recipe for moms with babies on their hips. As is the case with most everything I do, my baby was on my hip (mostly nursing) or at my feet creating obstacle courses for me with all the bowls, bags, and containers in her reach. 1. Chicken is bland, flour is bland. Salt and pepper (even with other spices!) in the dredging flour (even in the breadcrumbs too!) hasn’t satisfied me. 2. I buy the really expensive delicious eggs and I eat them every morning. I didn’t want to waste one (or two!) in this breading process. 3. Breadcrumbs are yummy, but the packaged ones had additional ingredients that I didn’t want. I knew I had an organic sourdough baguette end, so I toasted a few slices and ground them up to a nice texture. 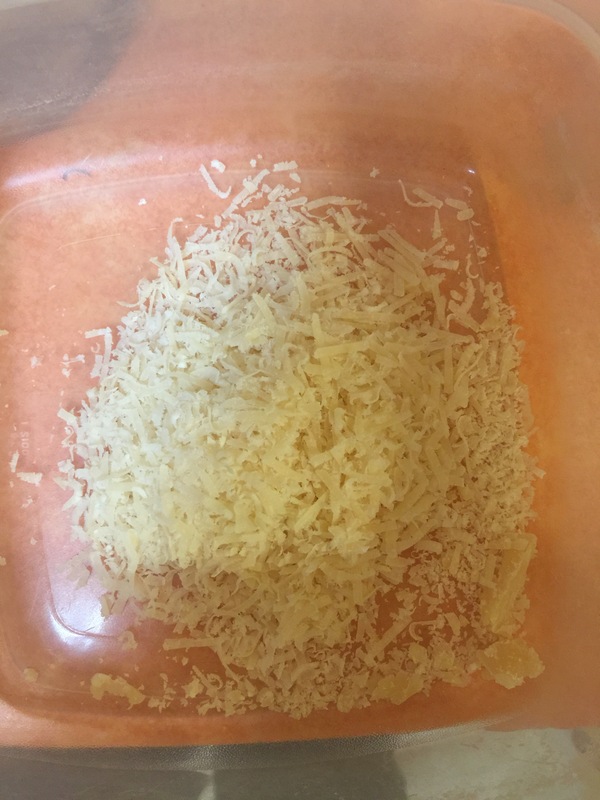 Parmesan was unnecessary but added flavor without more spice. Coconut was also unnecessary but added sweetness without refined sugar. First I added spices to the cut up chicken and mixed it with a fork. I was pretty liberal with the seasoning. 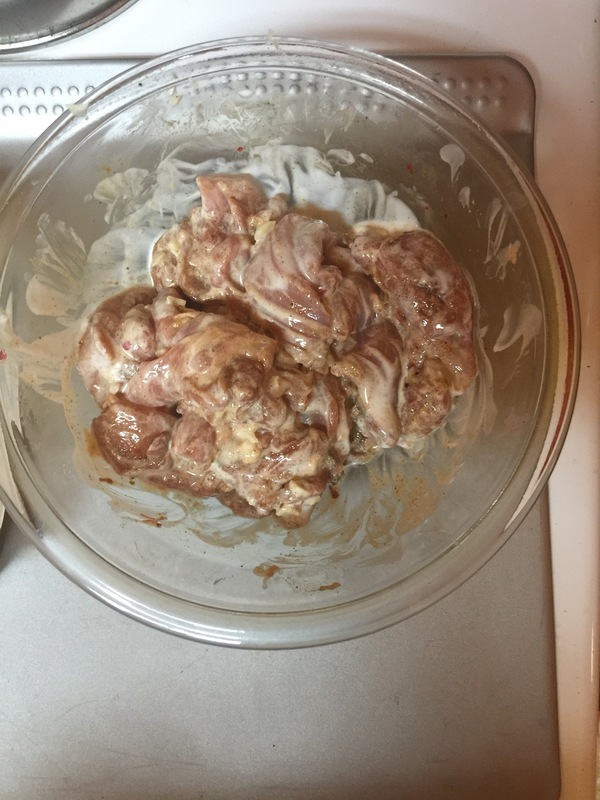 Then I added a few glugs of lassi to the bowl and mixed it enough to just coat the chicken. 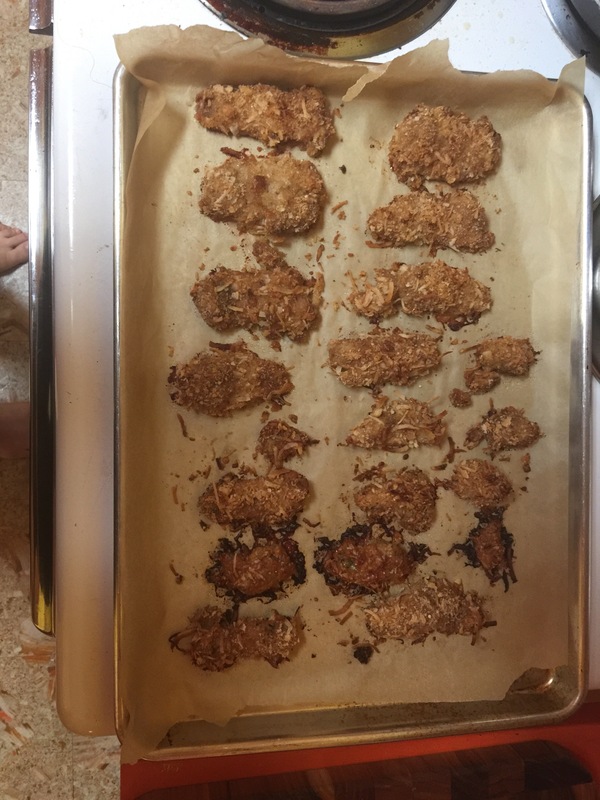 I mixed the breadcrumbs and Parmesan (about equal parts) with a handful of coconut, lined my cookie sheet with parchment paper, and one by one I coated each piece of chicken with the breading mixture. When I got to the last 3 little pieces of chicken, I was out of breading, had no reserve crumbs made, and had a fussy baby, so I opted for just Parmesan and coconut for those. The ended up much darker and also delicious. Next time I will periodically add more coconut to the breading, as it seemed to dwindle after the first few pieces. The end result was spectacular. I will need to make bigger batches because it won’t last long in the freezer. The chicks are getting big, of course, and wanting to explore. I don’t have the heart to put a cover on their brooder so they keep getting out and leaving gross not-exactly-breadcrumb trails showing me where they’ve been all night on my front porch. 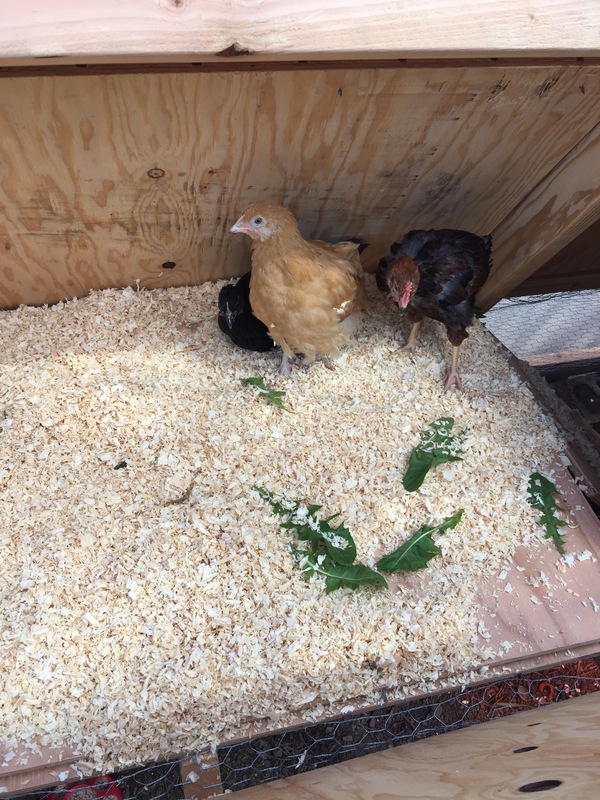 I re-vamped their area so they’d be leaving trails mostly on cardboard and paper, and hopefully after they transition to the coop it will be easy to clean up after them. Today, after many many many days of rain, it was cloudy, and I was home planting seeds. I realized quickly that the girls NEEDED to get out in this short window, as they’re about 6 weeks old and have only known pine shavings and front porchy things. I made a quick makeshift enclosure of the front yard next to me, and brought out clean water. Madame Secretary, the buff Orpington, came out first. She is largest but I’ve realized she isn’t the leader. She was a bit concerned to be out by herself. Rashida and Albertina came out together and they 3 huddled for a moment and moved about in close proximity. It seemed they got pretty excited about the new things to peck at. Sadly, it began to rain – although lightly. I stayed out and finished the planting, and as I was getting ready to bring them in I noticed they were nearing the bushes for cover. Thankfully it was a smooth and easy exploration, no casualties or chasing involved. I look forward to more! And the parts to the chicken coop are all sitting in wait, measured and cut. I will do a lot of things with a baby strapped to me, but using a circular saw to cut the angles on these boards isn’t one of them. Soon I will have help.